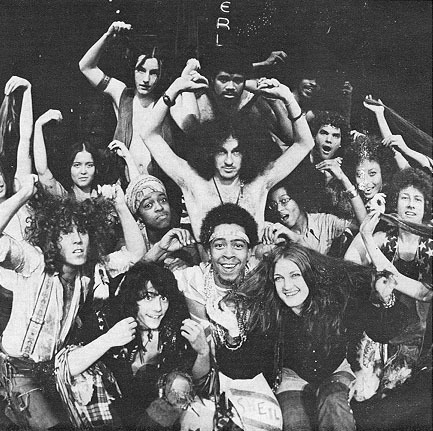 Hair in Washington DC 1971. front row left to right: Gregg Smith, Steven Scharf, Bob Mandolph (Claude), Patty Keene (Sheila). Middle row left to right: Debbie Andrews, Paula Larke, Greg Karliss (Berger), ?, Dennis Cooley (with stars on vest). Back center over Berger is Ted Lange. To return to the Hair Online Archives click here.